As the old adage goes, “you only have one shot at making a good first impression.” Well, it seems the folks at Fiat are paying that no heed. After a lackluster advertising campaign with Jennifer Lopez — and a moderately more successful second attempt with Romanian model Catrinel Menghia – Fiat has decided to splash some “tiger blood” over its Fiat 500 Abarth ads, giving it a brand new sheen – Charlie Sheen, that is. Yup, that’s right, Hollywood bad-boy Charlie Sheen is being featured in the latest commercial for the Abarth-tuned Fiat 500. For those that might be a tiny bit unfamiliar with Abarth, the Italian racing car maker has been around since 1949. Abarth became well-known for making high-performance exhaust pipes, and later, its various tuning kits for road vehicles. The company was later purchased by Fiat S.p.A in 1971. With Sheen’s involvement in Fiat’s latest marketing push, we imagine the Italian automaker is looking to add some bravado and bite to its economy-sized hatchback. As you may remember, Sheen was the former star of CBS’s “Two and a Half Men,” a role that reportedly made him the highest-paid actor on television until his very public issues with substance abuse and subsequent firing from CBS for insulting the show’s creator. 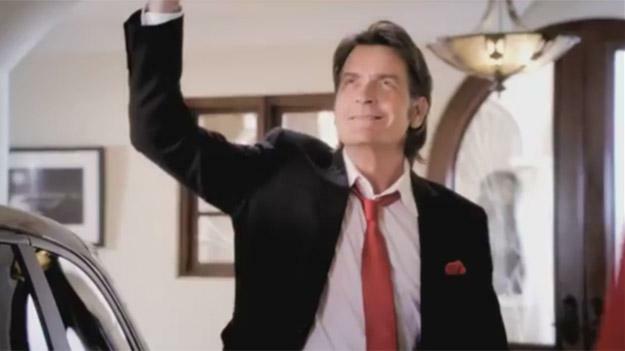 At Sheen’s peak, he was earning a reported $1.25 million per episode, which, when adding in back end syndication, grew to about $2 million, or roughly $48 million per year from the shows typical 24-episode season. Still, despite his meteoric rise and fall, and being hospitalized three times for substance abuse, Sheen doesn’t seem to mind poking fun at himself – which we have to applaud. Of course the question remains: with Sheen’s dramatic, drug-infused past, and bad-boy antics, has Fiat finally found that WINNING formula to promote its performance car in Sheen? We’ll have to see. Let’s all just hope our vein’s don’t need to course with “tiger’s blood,” or require the status of “high priest Vatican assassin warlock” (he really said this stuff, folks), in order to drive the 500 Abarth when it goes on sale this spring.